February is National Low Vision Awareness Month, and the National Eye Institute is outlining five new technologies currently in development to make life for those with low vision or blindness easier. Low vision is characterized by difficulty performing daily tasks even after receiving treatment in the form of glasses or contacts, medications, or surgery. The type of vision loss can vary based on the cause and can affect different aspects of an individual’s life. For example, the loss of peripheral vision may be due to glaucoma and can impact your ability to walk and drive, while central vision loss can occur because of age-related macular degeneration and make tasks like reading difficult. To help those living with low vision and blindness, researchers are currently developing technologies that can be used to make some of these tasks easier. Continue reading to learn more about these new innovations. Co-Robotic Cane: A co-robotic cane is currently being developed by Dr. Chang Ye of the University of Arkansas, Little Rock to aid those with low vision in maneuvering indoors. There is existing GPS-based technology available to help people find a location, such as a building, but it isn’t useful for finding and navigating specific rooms within a structure. 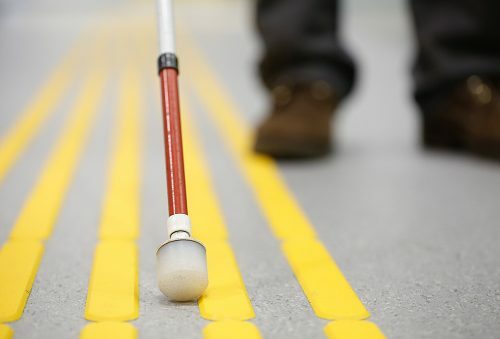 The cane functions by providing feedback about the user’s environment, using a 3D camera and a motorized roller tip to drive the cane forward for the user to follow. The cane also stores preloaded floor plans that can be accessed through voice recognition, though Ye hopes to have the cane capable of downloading a building’s floor plans through Wi-Fi upon entry. Robotic Glove: Dr. Ye is also working on a robotic glove to help the user locate and use small objects and doorknobs. The fingerless glove uses a camera and speech recognition to identify an object, then guides the hand’s movements through tactile prompts. For example, the user could say the word “mug,” and the glove would stimulate the nerves in the hand in a distinct pattern to guide their hand towards the mug and help them pick it up correctly. Crosswalk App: Dr. James Coughlan and his team at the Smith-Kettlewell Eye Research Institute have created an app for smartphone users that emits auditory signals to help the user identify a crossing location and stay within the lines of a crosswalk. Through the use of GPS, computer vision, and a geographic information system, the app is able to find the location where the user is standing, locate crosswalks and stoplights, and identify if there are any disruptions to the intersection such as construction or uneven surfaces. The combination of these technologies can work to guide the user safely through the crosswalk. Low vision and blindness affect 4.1 million Americans, and these new technologies are just three of the many in the works to help them accomplished daily tasks safely. While these tools require further testing and development, they provide hope that tasks such as crossing the road, navigating a room, and opening a door will be able to be accomplished much quicker by those affected by low vision and blindness.